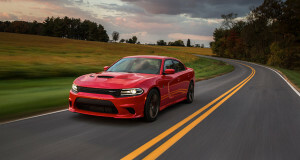 Dodge is looking to its impressive history to expand the trim lineup for both the Dodge Charger and Dodge Challenger muscle cars. Beginning this fall, the race-inspired Dodge Challenger T/A and Dodge Charger Daytona will roar back into action after being out of production for years. That is exciting news for both classic car enthusiasts and anyone who enjoys peak levels of automotive performance and style. Here’s what we know about both models so far. This car runs on a 5.7L HEMI V8 that delivers 392 hp. It also features unique performance upgrades like active performance exhaust, larger wheels, a lowered suspension, premium shock absorbers, and sport-tuned stability controls with three different settings. The car will also have a classic look and feature satin black paint, air catcher headlights, ‘70s-inchpired gauges, custom embroidered floor mats, and lots of other flourishes. Drivers can upgrade to the Dodge Challenger T/A 392 to get a heftier 6.4L V8 engine that boosts power to a robust 485 hp and can hit 60 mph from a standstill in about 4.5 seconds. The same engine and performance upgrades will be available, but this car also adds a cold-air induction, 2.75-inch electronically controlled exhaust system, as well as different calibrations for the engine and transmission to boost acceleration. The look of the car is inspired by the Charger SRT models but also shows off a HEMI logo on the hood, Daytona graphics on the rear fender, black Napa leather and suede seats with gold stitching, and aluminum and gloss-black interior trim. New features include driver’s seat and steering column memory settings, Bi-Xenon headlights, LED ambient cabin lighting, and sensors to make backing up easier. Both of these cars will have an MSRP from around $40,000, which is not much more than the standard issue Charger and Challenger models. The T/A will ship out in September with the Daytona to follow in October. You can get a look at both vehicles and take them out for a hair-raising test drive at our dealership. Visit us at 25600 S.W. Parkway Center Drive in Wilsonville, OR during our regular sales hours, Monday through Saturday. If you have any questions, feel free to get in touch.